Here’s a post full of polka dots on a couple of projects for you! I finished up my first Lady Skater dress, a pattern by Amanda from Kitschy Coo, and I definitely understand why this is another knit dress I’ve seen all over the sewing blogosphere! This outfit ended up looking a bit twee with the polka dots, light shoes and hair bow, though I didn’t mean to dial up the saccharine so much. Yak. Apparently I have a hard time styling this dress, because I wore it for drinks out last Friday with black tights, black boots, and a black cardigan and realized I was possibly wearing almost every piece of black clothing I owned. Maybe this is why I usually only accent with black. As you might guess, there’s no “little black dress” in my wardrobe. Anyway, I made a few simple adjustments to the pattern. Before tracing off my size (hoorah for each size having its own colored line!) I compared the bodice length with Moneta, which is the perfect length on me. I ended up shortening the Lady Skater bodice pieces by 1.5″. This was super easy since I didn’t need to true the sides even a little bit, as the width at the waist stayed the same for higher than my alteration. I think this is a better armhole and shoulder matchup on me than Moneta, but I suspect it’ll take future versions of both to know for sure. 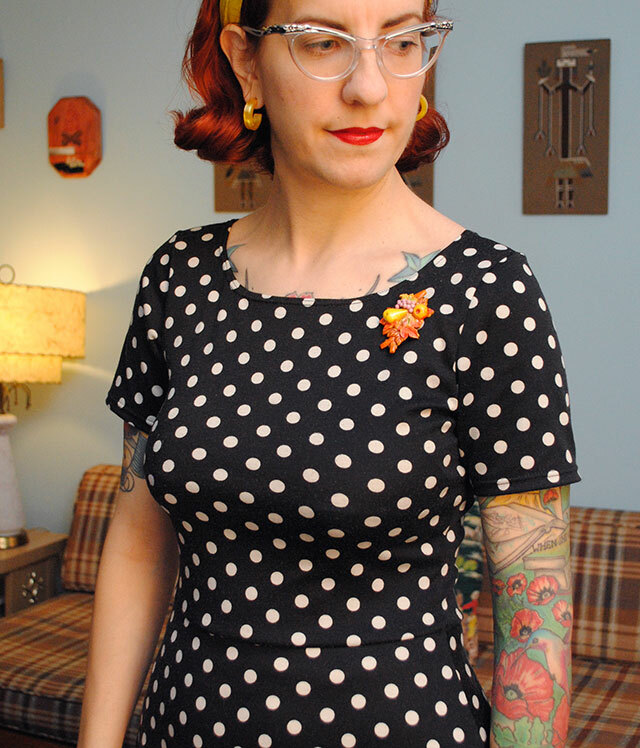 Especially since I gave this dress short sleeves instead of the cap, 3/4 or long sleeve options in the pattern. All I did was cut the sleeve pattern piece a couple of inches lower than the cap sleeve length. This is a sleeve length I wear more regularly, so I suspect the next Monetas will be short-sleeved, too. You’ll see that I opted to skip the sleeve and neckline bands. I think it’s a really cute part of the pattern, but decided it didn’t feel quite “me” enough. Although in hindsight, I think I’ll try it on a future version, since I’m now second-guessing myself of course. Instead, I raised the front neckline by a couple of inches, and just turned and topstitched the neckline and sleeves. There are two versions of the instructions: one with really detailed photos and instructions for newbies to sewing with knits, and one for self-proclaimed bad asses. While I’m a newbie, I had also just finished up two Monetas, so I more or less plodded along without following the instructions much, constructing it in the same manner as Moneta. And thus missed an interesting construction bit! Instead of attaching the assembled skirt to the assembled bodice, you sew the skirt front to the bodice front, the skirt back to the bodice back, and then sew the side seam from the sleeve down to the skirt (instead of just from the sleeve down to the bodice). So clearly I followed the directions not for bad asses, but for asses who don’t bother to read. I used a stretchy ponte knit fabric from Girl Charlee, and it’s not the most amazing fabric in the world. It already looked a bit doggy after pre-washing, so I suspect it’ll get really pilly fast. But I’d purchased 3 yards and squeaked Lady Skater out of a smidge more than 1.5 yards, so I figured it would be worthwhile to use up the rest for something easy. 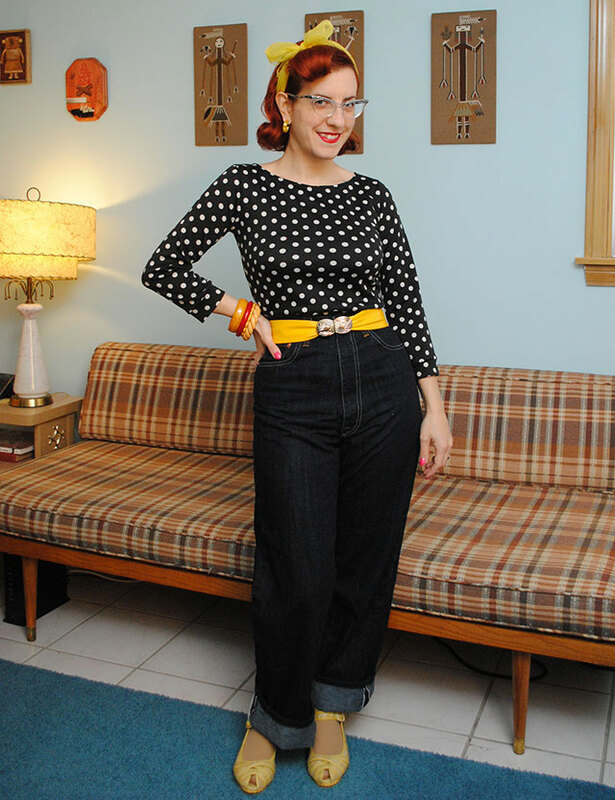 Since I’d been daydreaming of polka dot t-shirts for awhile, I sewed another Coco out of the leftovers! Just for the hell of it (and probably because I didn’t add them to Lady Skater), I added bands to the sleeves. For a first try, they’re not bad! I knew to cut them a bit shorter than the diameter of the sleeve and to stretch slightly as I attached them. But I accidentally cut them about 1/4″ too short, so they’re a tad smaller than they should be (though it’s not really obvious in the photos). It isn’t enough to bother me to rip them off and re-do them, though. I think the bands add a cute touch to this tee. Not much else to say about Coco that I didn’t say about my first one, except that I hacked 1.5″ off the bottom since I wasn’t sure if my notes on my yellow one were telling me I cut 1″ off the pattern piece or the assembled top, and when I tried this spotty one on, it definitely was longer than I wanted. I love that I have a nice t-shirt pattern to rely on, although I want to try a Renfrew soon, too. I always used to think sewing t-shirts seemed so boring, but honestly they’re fast enough I definitely see the appeal now! Especially when you can make them in something other than plain colors. I mean, I never see polka dot tees! Now there’s something you may have noticed with my first few knit fabric projects (and my allusion to Moneta #2 which I haven’t blogged, but is green with white stripes): the fabrics aren’t necessarily very Tasha. And by Tasha fabrics, I mean… well I’m not sure what. Kitschy. Loud. Ridiculous? I mean, a plain turquoise dress, some stripes and polka dots might be daring for some folks, but as you well know, I have no problem decking myself out in things no adult should rightfully ever be seen in like hot pink seahorses, cuckoo clocks, and birdcages. So if you worried you were going to start seeing a turn towards relatively tame projects from yours truly, it’s not so. What you’ve actually seen is that when I started buying knit fabrics, I went for more simple and not-terribly-expensive fabrics so I could understand and see and really know what I was doing, learn a bit about fabric types, and not feel bad if I truly mucked things up. And thus I’m trying to use up some of those fabrics. But I have a bright floral, Dutch-themed prints, and squirrels coming down the pike. Yes, I’ll continue to have some plain things peppered in (everyone needs some staples, right? ), but I’ll keep the crazy coming, don’t you worry. So where were we? Oh, yeah, I was busy planning a red riding hood Emery dress (it’s Rochelle’s fault), a green cabled cardigan, a Moneta featuring the 7 dwarves carrying off the sleeping Snow White after she bit into the apple (yes, seriously), and searching for a good dinosaur print. So there! Yay! Is it that Red Riding Hood toile? I have a skirt I made of that in the same colorway as Rochelle! It will be a fantastic Emery! Yes, the same fabric Rochelle used too! I actually recently bought a Charley Harper knit fabric as well, I’ve been eyeing them for awhile (and eyed the wovens before I sewed with knits, too!). I love the Teagan White designs, just wish they were more my color palettes! I couldn’t resist the Red-eyed vireo knit. I thought it was so perfect for a midwestern winter, and would be Christmasey without it being too literal. What did you get? While I like the polka dots, I’m very interested to see the 7 dwarfs Moneta on the way. Ooo! I’m pretty excited about the prospect of that one, too! I have a lot of love for polka dots, so these makes are definitely favourites of mine. I’m deciding between buying Renfrew or Coco and I’m not sure which to go with! A Lady Skater is pretty high on my to-make list as well. I love love love the Renfrew. It’s constructed beautifully and there are so many variations, including the Skaterfrew!!! Where on earth did you find Snow White fabric in a knit?!? This is something I must see! My question exactly! So thanks so much for leading us to it!!!! Oh goodness, your outfits are super lovely! I’m super excited to see all your upcoming ones, they’re going to be awesome! These are adorable! I’ve been meaning to make the Lady Skater forever… where are you getting your cute knit prints from!? They all sound amazing! Both of these are great staples. I like the black and white dots with red and mustard, too. Love both 🙂 Can I ask if you have problems sewing with a twin needle around the neckline of Coco when you get to the shoulder seams? I’ve found when the needles get to the bulk of the seams at the shoulders they skip stitches, or the fabric bunches up and refuses to feed through my machine properly. Gah! It’s been mostly okay so far, although I think I did skip a stitch on my first Moneta and didn’t really understand why. I do find it more difficult to do the curves, and more difficult turning them in as evenly as around the rest of the neckline, so I’ve been getting a bit more tunneling as I approach/leave the shoulder seam. But I’ve been just trying to gently coax the curve into a straight line as I sew and I use a walking foot, which has helped immensely! I love this dress but really, I wanted to comment to say that I keep trying to recreate your forward roll bang on my hair and I cannot ever get it to look so tidy. You must have such nimble fingers! Well, I’ve been doing it several days a week for quite some time, so it’s more practice than anything else! If you’re having trouble, you might try rolling your hair around a mascara tube. I hold the hair pretty taut when I roll it, too, and don’t let go of the roll until I’ve shoved a bobby pin into either side to anchor it to my head (changing the hand I’m holding with as I do that, of course). This dress is something I would wear each day, if I could^^ This also reminds me that the Moneta and the Coco pattern are printed and ready to assemble since almost six months…I need to start them as soon as possible. Both of these look so cute on you! I bet they would look cute worn with bright pink or red, too… do you have any sweaters in those colors? I really like it with yellow. Good choice! That dress looks so cute on you! Love the shoes, the pin, my goodness, I’m just wanting that whole outfit! I’m a sucker for polka dots. Where on earth did you ladies get the RRH fabric, I fell in love with it when I saw it on Rochelle’s blog this week and woudl love to make a blouse out of it. I think the polka dots with your yellow accents look really cute! Sometimes fair skinned women look washed out in black, but I think it looks great with your red hair. I think my favorite outfit is the top and jeans, but the dress is lovely as well. Tasha! 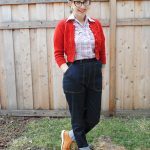 You’ve taken like a duck to water, sewing with knits! I’m really loving seeing this ‘other side’ of you develop, as it’s obvious you’re enjoying the experimentation :o) Both of these makes are super cute on you – I especially love the clean finish of the dress’ neckline and sleeves, but at the same time I adore the cuffs you added to your Coco! Perfection! Aw, thanks Marie! It’s been fun experimenting for sure! I’m so happy that I can be in the woven camp and the knits camp now, too, as it opens up so many more doors. By the way I’m really loving the cuffs on the Coco, I’ll definitely have to repeat that in the future!! I love the polka dots, you’ve made two awesome outfits. I’m in the middle of making a muslin for my lady skater too. I didn’t get pooling around the back but the back waistline ended up being higher than the front. I think I need to go up a size to account for my bust measurement. I also missed the bit about sewing the entire side seam in one go. Just discovered my error after reading your blog. Glad I helped someone else find that smart part of the instructions! I definitely want to try it out next time. Good luck on your muslin! 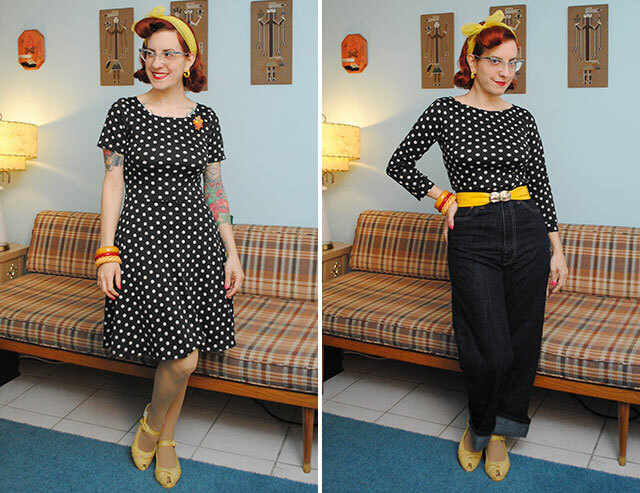 I REALLY like both of these garments – and they look so lovely accessorised with yellow. 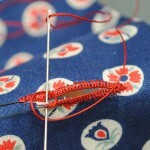 I’ve recently discovered the wonders of dressmaking with jersey fabric and overlocker – so quick, so forgiving, so EASY! 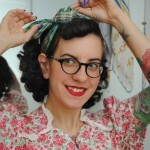 I do enjoy reading your blog and seeing all your Vintageness. Ahhhh, see I loooove polka dots! The dress is great and would usually be my favourite, but that top is really doing it for me, it looks fabulous. I love both the dress and the top. So cute. And your styling is always great.